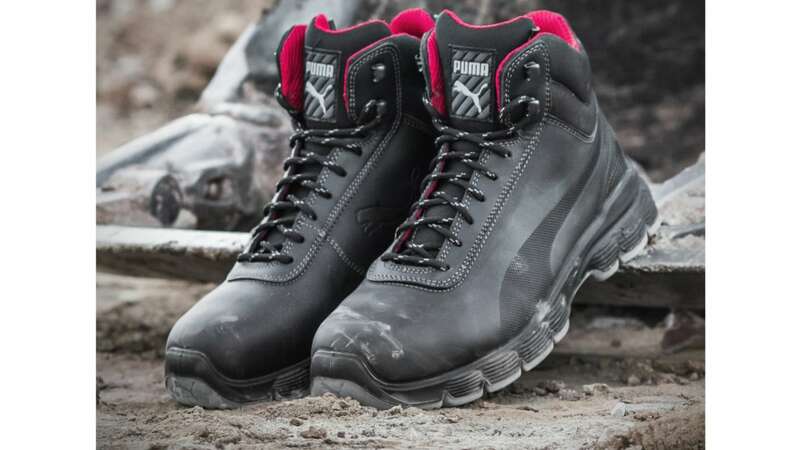 The next generation of the PUMA SAFETY REBOUND line offers optimized cushioning capacity and comfort to reduce physical stress to the largest extent. This guarantees fatigue-free and joint-gentle working. The heart of the REBOUND styles is the comfortable 3-layered PU cushioning concept consisting of the fast reacting BOUNCE LIGHT midsole in combination with the evercushion® pro ESD footbed and the robust outsole. The new BOUNCE LIGHT midsole stands for optimized cushioning over the whole foot. The specially placed curvatures and horizontal groves offer additional room for expansion of the material and allow a high degree of energy recovery (trampoline effect). The compact PU outsole ensures the necessary stability. Due to its high material density the slip resistant outsole (SRC) wears out less and thus prolongs the life of the shoes. The striking profile divided in different segments offers maximum support and grip on uneven as well as wet and smooth surfaces. The wide cleats at the outer edge ensure a high level of stability. The soft PU material of the evercushion® pro ESD insole provides an effective cushioning from occurring until the end of the movement, thus relieving the pressure zones. Its durable fabric cover and the perforated area at the forefoot ensure both breathability and comfort. Electrostatic charges will be discharged from the body. The six styles of the REBOUND line with the safety categories S1P as well as S3 and ESD are suitable for all field of work such as logistics, industry, trade and construction. Find more information under www.puma-safety.com.